Tracy promotes and leads the hugely popular seven piece band Plum Busby offering an eclectic mix of country, folk, blues, jazz, calypso, music hall and idiocy. "If you ever see this band advertised, do your best to get to hear (and see) it. It's a duo comprising Tracy Coleman, voice, and Stuart Hall, various guitars. Tracy sang with us during the summer and was sensational and Stuart has played with us many times on double bass always to huge appreciation for his musicianship and eccentricity. 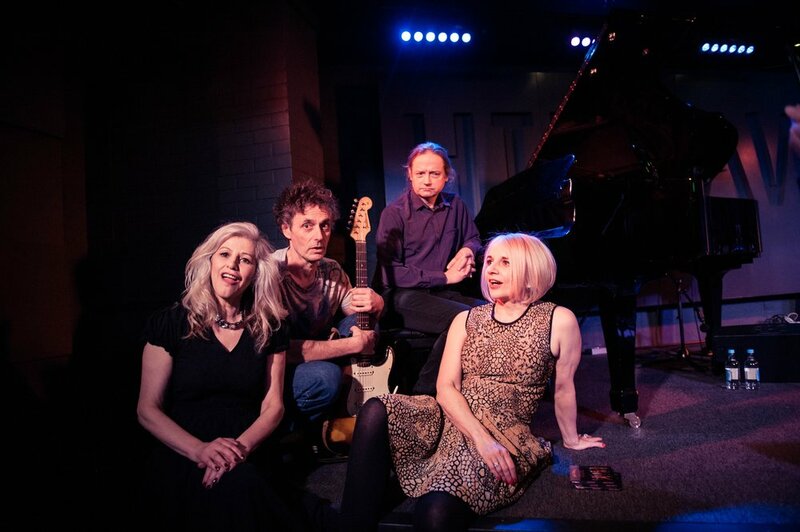 And Plum Busby, which can expand and contract like the Elastic Band, sing and play from an eclectic songbook of many styles, with an accent on good tunes, wit and virtuosity. If you don't like them, I'll refund your entrance fee and have you sectioned." If you want something completely different, musically speaking, you probably need an evening with the unique Plum Busby, Theirs is an original mixture of humour and sauce in the direction of Weimar cabaret or gutsy Weil: Blitz music-hall, Harlem jazz, lonesome Bluegrass, Las Vegas glitz, and then something else on top. Ah yes, the invigorating presence of the incomparable force that is lead singer Tracy Coleman. Funny, friendly and luscious, Tracy Coleman is the singer, dancer and incidental comedienne who provides the honeyed va-va-voom that sticks the show together. Her backing singer, adept harmoniser and perfect foil is the gamine Mandy Carlton. Versatile and creative Stuart Hall can't get a word in, so he just makes more music on an impressive range of instruments. Founding father of the group and self-appointed master of ceremonies is the multi-talented guitar and vocals man Huw Thomas, a dab hand at playing two recorders simultaneously, though his preliminaries try to persuade us there is a third one, fundamentally hidden. Winston Clifford, the new drummer, almost steals the show, not least when he steps away from his kit to take the mic and dumbfound the audience with his incredible jazz vocals. The success of the mix has something to do with the group's own convivial chemistry, a shared rough humour where most of the jokes are against themselves, and of course there is Tracy Coleman's wit, powerful voice and buzzing personality. If you are after a good time, a bit of a hoot as well as a lot of great music, do not miss Plum Busby's next gig.